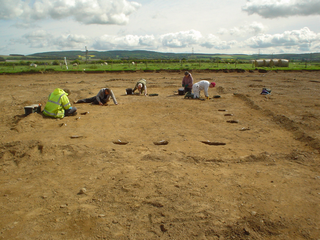 This project describes the results of excavations extending over 4.5 hectares on land at the eastern edge of Cheviot Quarry, adjacent to Woodbridge Farm (NT95203269),Northumberland, in May, September and November 2005. The work was undertaken in two phases: in May 2005 (Phase 1) investigation was undertaken on two areas comprising a total of 1.5 hectares on behalf of Tarmac Northern Limited which revealed significant Neolithic archaeology; in September - November 2005 (Phase 2) investigation was undertaken across the remaining 2 hectares, funded by English Heritage through the Aggregate Levy Sustainability Fund which revealed further Neolithic archaeology. 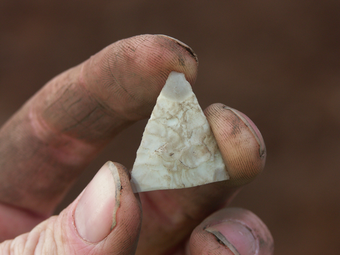 These excavations have produced important evidence for Neolithic, Late Bronze Age and 'Dark Age' settlements. Neolithic pit features containing domestic midden material including broken pottery, lithics and cereal grains from two distinct parts of the quarry have provided evidence for what is interpreted as settlement and subsistence activity from the Early and Later Neolithic periods. Together with the Neolithic remains from the nearby sites at Thirlings and those recently excavated at Lanton Quarry, these sites provide evidence for significant, and perhaps intensive, settlement on the sand and gravel terraces of the Milfield Plain throughout the Neolithic. Indeed these sites provide the precursors to the better known ceremonial and 'henge' complex located nearby but which date to the Beaker period. Radiocarbon determinations associated with the full sequence of Neolithic pottery have been obtained from Cheviot Quarry and analysis of the residues adhesing to the ceramics has provided some of the earliest evidence for dairy farming in the region, as well as information relating to other dietary and subsistence practices. Two substantial roundhouses with protruding porches, internal hearths and pits containing domestic refuse, provide the first evidence for Late Bronze Age lowland settlement in the region. The botanical macrofossil and faunal evidence, together with the pottery residues, show clear evidence for arable and pastoral activity in a small, unenclosed farming settlement. A detailed programme of radiocarbon dating and the application of Bayesian modelling has shown that these two buildings are contemporary and date to the tenth century cal BC. In addition to this prehistoric archaeology three 'Dark Age' rectangular post-built buildings were also discovered on the site and have been radiocarbon dated to the fifth or early sixth century cal AD. These substantial structures are thought to represent the homesteads of a small farming community, although the lack of material culture from these heavily truncated structures makes understanding their use and cultural attribution problematic. Because of their early date these buildings could have belonged to either post-Roman British inhabitants or perhaps early Anglo-Saxon mercenaries or settlers. A reconstruction of one of these buildings has been built close to the site at the nearby Maelmin Heritage Trail where it can be visited by the public.